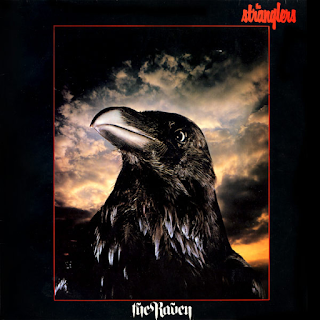 After their pub rock, Doors-influenced approximation of punk of their first two albums and the adventurous experimentation of "Black And White", by 1979, The Stranglers had gone pretty much full-on upbeat post-punk, with Kraut-rock and art-rock influences. It is most certainly not a punk album. Personally, I much prefer this material from them than their 'punk' offerings, which I always felt were somewhat awkwardly pre-meditated. I feel this is the group doing what they were far more comfortable doing, at the same time testing their musicianship and songwriting too. It was here that they showed that they were a good band as opposed to pointlessly-aggressive, posturing oiks. This is a serious, creative album and not remotely commercial. It doesn't jump on any bandwagon, either. Despite that, it was very successful. 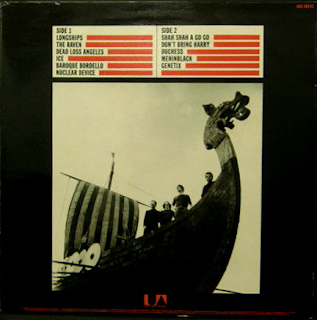 "Longships" is a brief, upbeat, organ-driven instrumental to start the album before the post-punk intro to "The Raven" kicks in, together with the sort of European-style keyboard riff that The Stranglers would come to specialise in over the next few years. It is a great track, full of swirling, moody atmosphere. "Dead Loss Angeles" is another in the same brooding, sonorous mould with an insistent, bassy, deep beat and a deadpan vocal from Hugh Cornwell. "Ice" has a quirky, keyboard riff in advance of Ultravox, The Human League or anyone else who started using them around 1980. It is a sort of post punk meets new romantic melody and, for the time, was quite innovative. "Baroque Bordello" has an extended instrumental intro before another beguiling vocal pre-empts Echo & The Bunnymen. It has a great bass line too. "Nuclear Device" has some punky aspects to it, in its vocal and background riffs. It has another Kraftwerk-inspired keyboard solo in the middle. It is apparently about a right-wing Australian politician called Joh Bjelke-Petersen, who, perhaps, shamefully, I had never heard of. "Shah Shah A Go Go" is a contemporaneously relevant number about Iran, with another industrial, dense beat. "Don't Bring Harry" is a most strange Velvet Underground-influenced number with a semi-spoken vocal from bassist Jean-Jacques Burnel. It is about the group's experimentations with heroin. "Meninblack" is similarly-inspired. You can tell, it is decidedly weird, with its deliberately-distorted, high-pitched "alien" vocals. "Duchess" was the album's only really poppy number, and it is a great one too, with a catchy refrain and killer organ riff. "Genetix" has an almost electric folk guitar riff and an oddly infectious groove to it. This is definitely one of The Stranglers' best albums - it is quite ground-breaking, inventive and worthy of several listens.